Steve Hackett’s new album is very dark indeed, and full of contrasts. 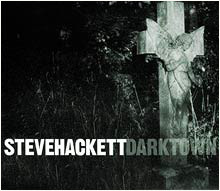 Darktown is the 17th album of his solo career and the first since Guitar Noir (1993) that can be called a studio production of new progressive rock material. The album title requires little explanation other than that “darktown” is an expression for African-American ghettos in the US (but that is not what the album is about). Photos of a gloomy cemetery cover the cardboard box as well as a booklet that shows, by virtue of lyrics (for eight songs), extensive credits and Steve’s explanations about the songs, where Steve Hackett and his band are taking their audience: Into the undergrounds and dark spheres of music that used to be a special interest of Hackett’s until 1980 and again since Guitar Noir, and into the darker regions of the human soul when Steve mentions bits and pieces of an occasionally pessimistic view of the world – a kind of aphoristic social criticism. Steve calls this album very personal (marketing gag or not?). It is very obvious that some of the things mentioned in the songs cannot be a product of a lively imagination alone, for they are too complex and too politically incorrect. Steve, however, cautions against excessive autobiographical interpretation. The music on this album is far from artificial construction, it is the stuff that dreams are made of in Steve’s emotional world. He expresses himself in his wonted musical idiom, but it has continued to develop, of course: Acoustic guitar and strings (sampled on this album) find their way into Steve’s rock music, and while he differentiates between the genres of “acoustic” and “rock music” he nevertheless begins to blend the one with the other. Darktown’s sound is less polished and superficial than on Guitar Noir, but full of love for the details. Thanks to a rapidly growing choice of sound gadgets and instrument add-ons new areas of sound have developed that the average music consumer is unable to analyze. They do not need to, anyway, because they can always resort to describing them in metaphors and expressions of emotions. Like Calling All Stations and Beggar On A Beach Of Gold the album – probably Steve’s last in this millennium – has an underlying concept. The liner notes help to make it clearer. It is, however, no concept album in the prog rock sense of the words, the material is less coherent. Steve has likened it to a work of drama, in which one should not examine the individual scenes too closely for fearing to lose the view for the whole. He explains that he appears in different roles throughout the album to further the action. The album is full of contrasts and this adds to the special flavor: There are light moments in the dark, fast and slow parts, rhythmic and floating music, warm-hearted and cold-blooded bits – let’s take a closer look. Omega Metallicus is the slightly silly title of an instrumental that is quite as perverse as the Highly Strung album of 1983. An interesting slap-bass pattern and a driving drum rhythm an entity called Beats ‘n The Hood has worked on are the foundation on which Steve build his collage of how different an e-guitar can sound when you are using effects. In the notes Steve praises the Fernandes sustainer and jokingly describes Omega Metallicus as ancient Etruscan for “Let’s party”. In the middle of the track things become remarkably melodic – it is the guitar theme of Cassandra, a song from the unreleased 1988 album Feedback that was published with Brian May on the American Viceroy pressing of Guitar Noir. Another bit resembles a pinball machine. This is the second time after Slot Machine on Feedback that Steve pays homage to his passion for this kind of amusement. The title track is a furious indictment of the British educational system. “Power masquerading” has caused psychological problems in all who suffered from it. Speaking with a dark, dead voice Steve paints a vivid if unattractive image of the victims of education. Ghostlike arpeggios on the electric guitar accompany the verses. A dark admonishing tune makes up the chorus; later eerie and alarming sounds come in – something like a siren and further atonal elements and sounds. A great performance is delivered by Ian McDonald with his angst-ridden sax improvisations. McDonald, co-founder of King Crimson, is no stranger to Hackett fans since Steve went on tour in Japan. The sun comes out for Man Overboard, a song that paints a romantic idyll of ocean, sailingboat, holidays, dusk … torn apart by the message that a man has been pushed overboard. No comment provides a clue as to how this is to be interpreted. Steve came up with this song during a vacation years ago while Kim was looking for parrotfish (this is actually the only time she is mentioned in the booklet). Man Overboard is incredibly rich and beautiful, full of calm seas (lots of echo and violin tremolos), acoustic guitars, strings, choir and Steve’s, um, vocals. The Golden Age Of Steam is a song of ironic beauty and merriness. Inspired by The Diary Of Anne Frank, it tells the story of a Dutch boy who betrays refugees to the Nazis during WWII for a living. The dominant element in this song is a kind of march on drums and fife. It occurs in the beginning of the song (there resembling The Battle Of Epping Forest) and pops up again throughout the song in other arrangements. Backing vocals on The Golden Age Of Steam are sung by Mae McKenna whose 1982 album Mirage & Reality Steve produced in 1992. Those who are interested in history will notice the original radio report of the US army landing in the Normandy. Twice Around The Sun is an instrumental that consists of two solos on electric guitar and a brief bridge. The first solo (“pounding”) sounds like someone employing all their strength because of the key (E Minor with many modulations) and the overall sound. The bridge has an irrelevant guitar melody and fretless bass; it is a nice introduction to the second guitar solo (“floating”): We have reached warp speed, Steve’s guitar cruises powerfully and effortlessly through the spheres before it ends with possibly the longest guitar note ever recorded (65 seconds). Lavish mellotron strings will delight the older fans, too. This instrumental is a delight for fans who enjoy big Hackett guitar solos; it may also be considered a worthy successor to the Firth Of Fifth solo, to Spectral Mornings, The Steppes and Flight Of The Condor / Sierra Quemada – though the jury is still out on whether this becomes another milestone in Steve’s career. What follows is Steve’ non-commital statement that not everything ends after death. Rise Again is a sober song resembling Like An Arrow (from Guitar Noir) until the three verses are complete. Then there is a fast instrumental section full of interesting features, e.g. Steve’s ad-lib vocals with that kind of edge to it that could first be heard on Solid Ground (from Blues with A Feeling, 1994). Aron Friedman collaborating with Steve on this one produced a particularly contemporary note. A kind of proletarian battle chant (a roaring “Yeeah! Heey! Yeeah!”) introduces Darktown Riot, another gloomy but rebellious rock piece with techno elements (thanks to Beats ’n’ The Hood). It sounds like destruction and describes in deep passages full of dissonant sounds and a mumbling dead voice what young people can do if they are led astray… Perhaps Darktown Riot is a fin-de-millénaire version of the 25 year old Tower Struck Down (from Voyage Of The Acolyte, 1975), a song which even then reminded everyone of the danger of Nazism (cf. the “Sieg Heil”-samples). Both songs ends with a ghostly epilogue that describes the destroyed landscape (perhaps like the World Of Corruption from Peter Gabriel’s Eve). The final piece, In Memoriam, is gentler again, though it does not provide a happy ending either. It deals with the idea of feeling alienated from society and also alludes to death after which, according to the liner notes, the spirit of all creatures (even of slimy slugs) lives on – at a party to which God invited everyone… The verses are spoken by Steve, while the chorus (simply “in memoriam”) are sung by several voices with lots of echo.